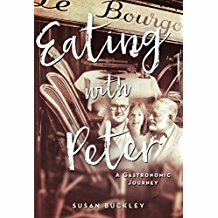 EATING WITH PETER, Arcade/Skyhorse Publishing, tells Susan Buckley’s life-changing journey intertwining high romance, gastronomy, and an unsurpassable joie de vivre for readers of JULIE AND JULIA and MY PARIS KITCHEN. Susan’s life would never be the same after she meets Peter Buckley. A man who was larger than life, Peter pulls Susan out of her comfort zone to taste the fine life, literally. Together they embark on a rollicking adventure through Michelin-starred restaurants in France to the souks of Morocco and the waters of the Red Sea and the Caribbean. They explore the world, and along the way discover the most desired tables (sometimes in a tent) and the best markets, moving from Peter’s adventures with Hemingway to sampling delectable treasures in an Alpine meadow. When they return to New York, Susan and Peter—a writer, photographer, gourmand, as well as an inventive chef—incorporate their adventures into their daily American life. As they explore three-star restaurants, French farms, and Italian cheesemakers, the reader gets a taste of famous gastronomic dishes and their chefs, in addition to learning about mouth-watering recipes, culinary moments around the Buckley’s kitchen and table with family and friends, and many of their New York food secrets. If much has been written about La Haute Cuisine in the past, nothing compares to the fresh, personal, and tantalizing tone Eating with Peter offers. All twenty-eight recipes in the book have thoroughly been tested, and should invite the reader to recreate the joys of Susan and Peter’s experience. Janelle McCulloch’s LONDON SECRETS unlocks the city’s most fascinating mysteries, puzzles and enigmas as Ms. McCulloch strips away bricks, mortar and tarmac to uncover parts of the capital that even born and bred Londoners may never have seen. In the shadow of the Gherkin, Cheesegrater and Walkie-Talkie skyscrapers are medieval churches, crypts and the curios of Postman’s Park – proof that altruism can exist in the Square Mile. In St James’s, a stone’s throw from the glitz and glamour of Soho are hidden squares and shops dating from a gentler age – purveyors of fine wine, gentleman’s apparel and bowler hats. The cobbled mews of Marylebone and Hampstead Village reveal unexpected treasures, rarely seen interiors and a rural idyll amid the urban hum. While the esoteric collections at the Horniman, Sir John Soane’s Museum and exotica of Leighton House make you feel you are in an entirely different country altogether. The author reveals the traditions and quirks that have survived to this day, from the freedom of the City of London allowing you to herd sheep through the town, to the “market ouvert” of Bermondsey Market, original home of the London wheeler-dealer. 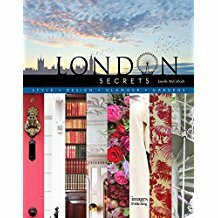 Lavishly photographed and researched, London Secrets will shed a whole new light on this most vibrant – and surprising – of cities.